Our Furniture Moving Sliders allow you to move heavy appliances, equipment, and furniture while protecting your floor from scratches and marks. Extra soft bottom of sleds allow them to glide easily across carpet, hardwood floors, ceramic tile, vinyl, or any hard surface. Great for large legs on tables or furniture. To make moving even easier, try the Surface Sled Handles. These metal handles hook into a hole on the front of the sled and allow you to push or pull the object by the handle. Hard Surface Sleds are furniture sliders or glides. Half inch thick foam rubber padding absorbs the weight of heavy objects like refrigerators, stoves, office equipment and furniture. I am about to have hardwood floors installed in my home with a dark finish and will need to move my heavy kitchen appliances back when the workers are finished (they won't). Since the finish will not have "cured" yet ( 2 - 3 months)and will only be about a week or two out from being stained, will this product prevent ruining the new finish on my floors? They will be touch dry and able to walk on. Can I use the glides and sliders under a recliner sofa? There are no legs it sits on a metal frame 60" x 22". If yes can the sliders be left there permanently for ease in cleaning the carpet? I have two pieces of furniture that each weigh 650lbs, a china cabinet and a buffet. I want to use sliders to leave under the base, so I can move to clean. one measures 88long x24deep, the other 77"long x 26" deep. I am considering purchasing a therapy table. Here is a link to the table: http://www.hilllabs.com/traction_massage/Hill-Rolfing-Table.php The table is about 250 lbs. It will be on carpet. I would like to be able to move it. When I set the table up, could I put your "Furniture Glides and Sliders - #A1025" under the legs and leave them under the legs permanently? Thank you! I bought a tote (24" L X 18" W X 12" H) to use as storage under my bed. The heaviest tote will have about 50 lbs in it. The room is carpeted which makes it hard to pull the tote out. This product seems ideal, except that I would want to keep the sliders under the tote permanently. Would that be possible ... it says it moves 300+ pounds and my item is at max 50 pounds? I have a very heavy refrigerator I want to move on a hardwood floor. In the past, when trying to pull out the refrigerator from the wall, the weight has dented the floor. I don't understand how you get the refrigerator legs onto these sleds, so you can even use them to pull the refrigerator? And how do they work to prevent damage to a hardwood floor? Has anyone tried to put a long sliders smooth side up to slide a heavy piece of furniture over them over a threshold? Do you think it would work? Can the long appliance sliders be kept permanently under a stacked washer dryer? Also, we have a tray under them now to help retain leaks. Can the tray rest on the permanent sliders without issues? Thanks. I bought a tv cabinet with a electric fire place insert that is extremely heavy. I have used sliders on all my furniture for years but this piece of furniture caused the sliders to bury down in the carpet and will not allow me to move the furniture a fraction of an inch. Are yours heavy duty enough to use under the legs of this piece of furniture? One of your answsers in FAQs indicate the Appliance Sled can only be used to transport over and on hard surfaces and not carpet. Why can't they be used to transport the objects over carpet? I had some similar ones years ago, that worked very well on carpet. Hi, I would like to permanently place this product under my kitchen fridge on a hardwood floor. Will they scratch hardwood? Also, can a 4-foot sled be cut to 2 feet to accommodate a counter depth fridge? Are there no products that facilitate moving heavy objects across carpets? Can it be used on a smooth concrete basement floor ?? What is the surface that contacts the floor? I can't tell from the picture. I need to move some heavy refrigerators across a linoleum (? vinyl?) lab floor, and don't want to scratch it. Furniture Glides and Sliders allow you to move appliances, equipment, and furniture while protecting Carpet, hardwood floors, ceramic tile, vinyl, or any hard surface from scratches and marks. We moved some extremely heavy umbrella stands that weighed more than 200lbs each. We could not find a way to move them before we purchased furniture glides and sliders.Glad we found them on Koffler Sales. Thank you for your review. We very much appreciate the feedback along with the detailed explanation of your use. Hopefully this will assist other shoppers. Great Product. Helped us move a very heavy wardrobe very easily across carpet. It saved the day! Thanks! Thank you for your review. We appreciate your feedback and are glad our Furniture Glides helped save the day. Absolutely unbelievable! In a good way! Thank you very much for your very detailed review. That was so nice of you to take the time to provide this extensive feedback. We try to offer only the highest quality products and we're so happy we've met the test with our Furniture Glides. If you ever have any questions feel free to give us a call. Bought these sliders to move a very heavy gun safe. I wasn't sure these were going to handle the weight but they did. These sliders are made of thick plastic and are very sturdy. I have used sliders like this before which seemed to be made of cardboard and did not have the thick foam that these have. I have moved all kinds of things with these besides furniture. Made quick work of the large Christmas tree box when it was time to store it away. I really didn't think I needed the metal handles as I could have used a rope, but I was wrong. The handles made it easier to grip and pull the slides. So glad I purchased these and handles. Definitely recommend. Thank you for your review. We very much appreciate the positive feedback concerning the quality of our Furniture Glides. You're right, it really seems like you received great use of them so far, and probably will have many other uses in the future. Excellent product and made my life so much easier. I had back surgery in 2011 and have to be careful. This product makes my life so much easier!!!! Don't know what I'd do without it. Thank you for your review and the kind words concerning our Furniture Glides. If you are going to have to move heavy furniture this is a must have. I have a double sided desk that has to be moved frequently and if you try and move it by pushing it around it pulls the carpet away from the carpet tack strip. Placing these under the desk makes moving the beast soooo easy. I leave them under the desk permanently. Luv these things! Thank you for your review. 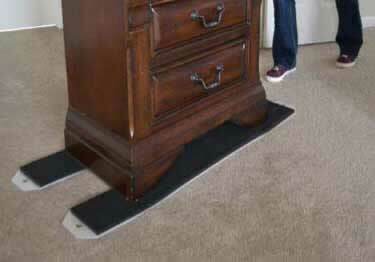 We're glad our Furnture Glides have made moving your desk so easy. We have had a lot of compliments similar to yours, and many people have just left the glides under their furniture permanently just like you. Great idea! These sliders are amazing. We used the sliders to move an extremely heavy desk with ease! Thank you for the review and we're very glad the sliders were a big help in moving your heavy desk. If there's any further assistance you need, please feel free to give us a call. I had some of these, different manufacturer, for my business, and had to get them for my home. We have a lot of carpet, and heavy furniture just slides around with no effort. If you want to slide a desk out for cleaning, magic! Great product and really aids in moving the furniture and helping to avoid injuries and problems. SUPER!!! !